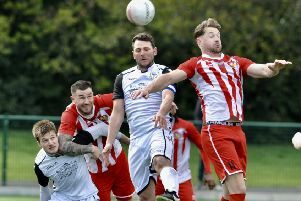 Hastings United Football Club manager Darren Hare was pleased with an encouraging pre-season display last night (Tuesday). The U’s were edged out 1-0 at home to an Eastbourne Borough side which plays its football two levels higher up the non-league pyramid. Borough scored the only goal in the 18th minute, but United came close on several occasions. Frannie Collin hit the crossbar, Harry Stannard and Collin were denied by outstanding saves, and Matt Bodkin had a couple of decent chances as well. “We started off playing 4-3-3, and we had little spells where we did okay and little spells where we didn’t go okay,” continued Hare. “I was disappointed with the goal on a couple of fronts, but up until that point they really didn’t create much and we were starting to get the upper hand. Hare was impressed with Stannard and Bright Temba, and is hoping to add both to the squad. Temba was part of last season’s set-up, while Stannard is a former Gillingham scholar who can play at the top of the diamond or out wide and likes to cut in from the left. The manager also praised Richie Welch, who started the game, and John Akoto, who came on at right-back. Welch is expected to feature again in tomorrow’s (Thursday’s) friendly away to AFC Uckfield Town in a United side made up mainly of East Sussex-based players. After that, United will continue their warm-up games at home to Welling United, who like Borough play in National League South, on Saturday and away to last season’s Southern Combination League runners-up Eastbourne Town next Tuesday night. It’s been a fairly quiet week in terms of signings, but striker Jack Harris is a United player once again having completed his transfer from Hythe Town. Hare says he is still on the search for a goalkeeper and has a left-back, Reece Butler, set to come in, although he’s not fit at the moment having injured himself at work. Formerly at Maidstone United, Butler is young, quick and good in possession. Hastings United’s remaining pre-season friendlies: Thursday July 21 AFC Uckfield Town (a), Saturday July 23 Welling United (h), Tuesday July 26 Eastbourne Town (a), Tuesday August 2 Westfield (h), Saturday August 6 Havant & Waterlooville (h).